First Science Wednesday for the Fall Semester! Science Wednesday is back for Fall 2018! 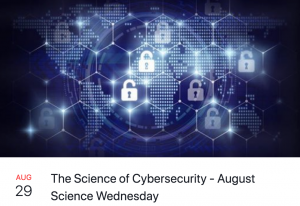 Join us as we talk “The Science of Cybersecurity” at Kings Live Music. Discussion starts at 6:30 pm, but plan to arrive early as seating is limited. Kings is located at 1020 Front St. in downtown Conway. Admission is free, and all are welcome! Wednesday is also 1/2 price pizza night at Kings– and as a special Science Wednesday offer, enjoy a free soda with the purchase of any food item!